One day David Small awoke from a supposedly harmless operation to discover that he had been transformed into a virtual mute. A vocal cord removed, his throat slashed and stitched together like a bloody boot, the fourteen-year-old boy had not been told that he had throat cancer and was expected to die. I can't even begin to describe what a gift David Small possesses. To be able to tell his story with such heartbreaking sparseness and visual bleakness, yet make you feel like you have been transported inside the story is no small task. My heart broke for David: for his family situation and the way he was made to feel worthless by his mother. And despite the hopelessness you feel as you fly through this book (once you pick it up, you won't be able to put it down), you are left, in the end, feeling hopeful for him. 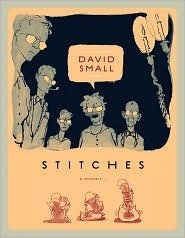 By far one of the best graphic novels I've ever read.